Night candles and lanterns abound which bathe this lovely camp in flickering golden light. Dinner is served on the wooden deck under the stars. Kwetsani Camp in the Okavango Delta, Botswana, offers superb water and land activities. Enjoy mokoro (wooden canoe) trips and explore the palm-fringed islands and water channels of the largest inland delta in the world. Day and night game drives are available, enabling guests to experience varied and diverse game viewing on this Botswana safari. Hippopotamus and Crocodiles gather in the deeper permanent Lilly-filled lagoons of the area. Lion, Leopard, Wild Dog, Zebra, Cheetah, Tsessebe and Lechwe are among the major game attractions at Kwetsani. Various nocturnal animals such as Aardwolf, Serval, Genet and Bushbaby can be seen on the night drives. It is sometimes possible to enjoy seeing the nocturnal predators in action. Depending on water levels, Kwetsani offers both land and water-based activities. 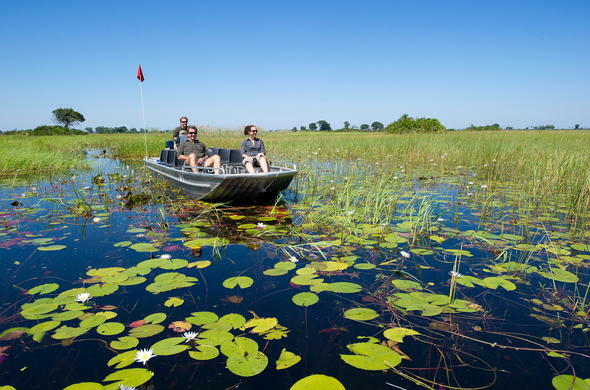 Mokoro rides are a highlight of this Botswana safari, exploring some of the most beautiful and intricate channels and islands anywhere in the Delta. In addition, guests have the excellent opportunity of spotting predators during the day as well as on night drives. Water-based game viewing in the Okavango Delta is from motorised boat or mokoro (dugout or fibreglass canoe). A Cheetah is carnivorous and eats a variety of small animals. While most cats are nocturnal hunters, the Cheetah is primarily diurnal, hunting in the early morning and in the late afternoons.